The world's finance ministers and central bank chiefs gather in Cairns, Australia. China's macro policy will focus on delivering comprehensive growth targets such as stable employment and inflation, and will not be distracted by changes in certain economic indicators, finance minister Lou Jiwei has stressed. 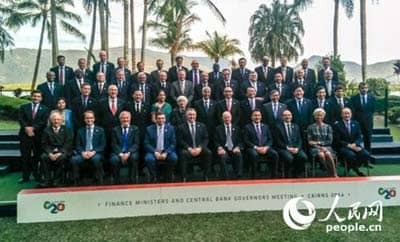 Lou made the remarks, published on the central bank website on Sunday, in the Australian city of Cairns as the world's finance ministers and central bank chiefs gathered to discuss economic and financial systems. Although China's economy faces downward pressure, there will not be significant policy adjustments to respond to changes in any single indicators, Lou said, stressing rather the importance of comprehensive target such as employment and inflation. Lou said China's ongoing efforts to reinvigorate the economy, such as reducing tax burdens on small businesses, bringing social capital to more sectors and reforming state-owned enterprises, will help stabilize growth. Lou's remarks came as some key economic indicators fell below market expectations in July and August, pointing to slowing momentum in the economy after a brief rebound in the second quarter. China's value-added industrial output growth decelerated sharply to 6.9 percent year on year in August, down from 9-percent growth in July, further signs of softening strength in the economy. The market has been expecting further monetary policy easing. On Wednesday, it was reported the central bank will provide 500 billion yuan (81.3 billion U.S. dollars) to five banks with a tenor of three months via the SLF (standing loan facility). In an interview with Xinhua on Friday, Wang Hongzhang, chairman of China Construction Bank, confirmed the move.